The Checklist Manifesto is currently at the top of my (mental) Favorite Books list. As a process/project/operations manager, I love it’s sheer practicality. Gawande, a doctor, takes a look at error rates across industries, focusing particularly on the medical industry, where errors have high consequences. He takes a playbook from the airline industry, which has very clear standards and checklists for every little thing. A large percentage of these are rarely used, as they pertain to obscure and specific malfunctions and errors. I’ve written many checklists and process documents in my 12+ year career, and I feel like one read (and copious note-taking!) barely scratched the surface of what I intend to review and implement in my own work.My biggest aha moment that is so simple it’s a “Duh, why didn’t I think of that?! What’s the point of your checklist? Gawande talks about the difference between a READ-DO and a DO-CONFIRM checklist. They’re fairly self-explanatory. 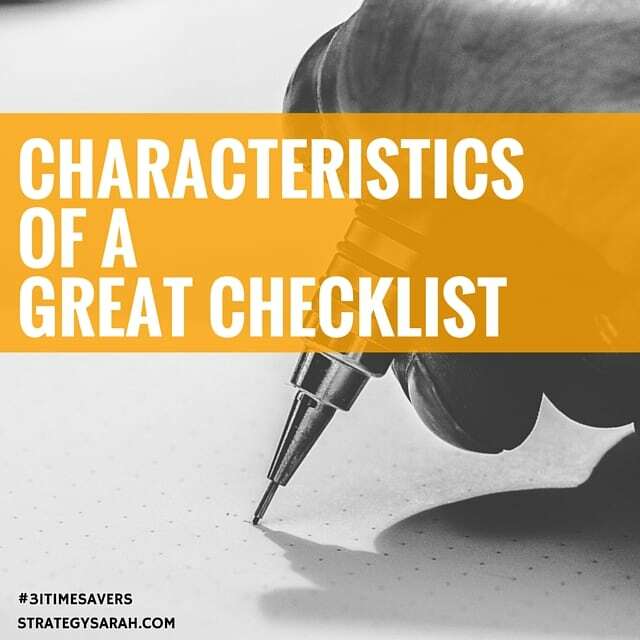 With a READ-DO checklist, you follow the checklist as you go as a guide to make sure you follow every single step. A DO-CONFIRM checklist is used as a final check after a process or task is performed, to ensure nothing is missed. DO-CONFIRM checklists are performed at set pause-points in a given process, and ideally only take 30-60 seconds to review. The concept of a DO-CONFIRM checklist was eye opening to me, as I think I (and many I’ve worked with) have always viewed a checklist as a READ-DO document. A READ-DO document is easy to discard as too much work, or irrelevant, or something that adds time, but doesn’t add value. Is there a clear objective? Can the checklist be simplified any further? Is every step clear and unambigious? Have you tested (and revised) the checklist in real-life (or as close to real-life as possible) situations? Will the problem or process be measurable improved by use of the checklist? 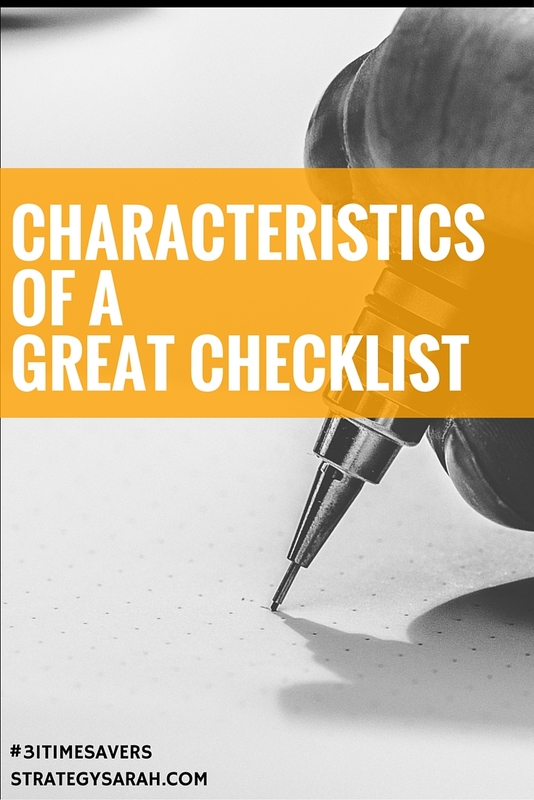 If you’re interested in a detailed checklist for creating your checklist, Dr. Gawande and Dan Boorman of Boeing’s official Checklist for Checklists can be downloaded here. What area(s) of your life could use checklists or improved checklists? I have been known to hop on to Facebook to post or check one simple thing in a project-related group and come up for air 45 minutes later, without having done the one thing I logged on for. I’m pretty sure I’m not the only one. While there is a time and place for keeping up with friends and social activity (after all, it is called social media), this should be intentional time. 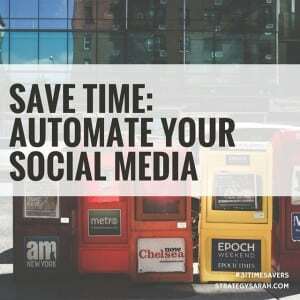 Fortunately, there are several social media scheduling tools to automate the process. Coschedule – Awesome scheduling tool for bloggers. 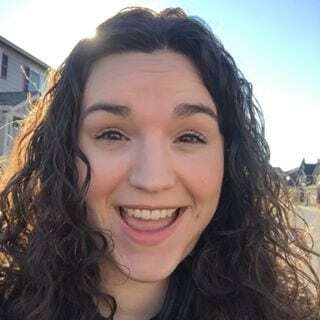 I had a paid CoSchedule account for an old blog, and it worked great. Getting one set up for this blog is on my to-do-someday list. Buffer – I love how simple and clean the user interface of Buffer is. I also love that they added Pinterest to the Awesome (paid) plan. Hootsuite – I’ve been a user of the free Hootsuite version for a long time. I love how robust it is, but the look and feel is definitely more techy/industrial. My favorite feature: autoschedule. SmarterQueue – The price point is a little higher, but I love, love, love that SmarterQueue will re-schedule evergreen content, meaning you’re never left with out content to post. If you do a lot on social media, using SmarterQueue is a great way to save time and money over manually scheduling content yourself or hiring someone to do it for you. Tip: You don’t have to use just one of these tools. 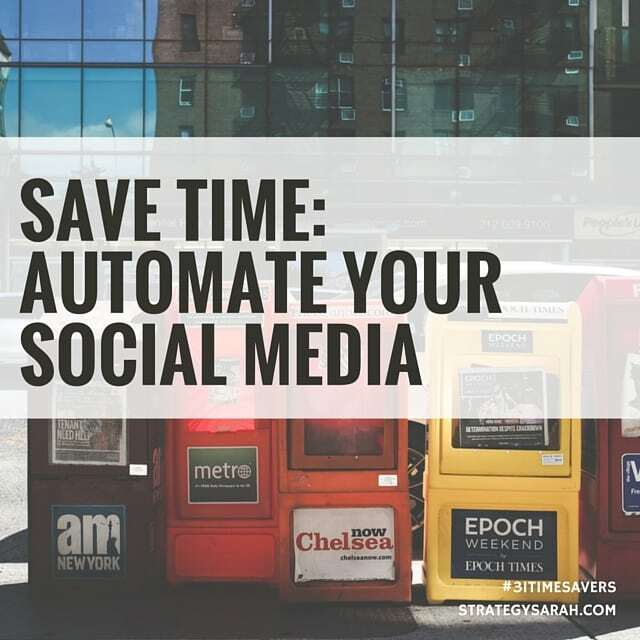 Using multiple social media scheduling tools strategically can increase automation, and potentially even save you money. If you’re super strapped for cash, you can use a combination of the free plans to automate more social media accounts. Buffer’s free plan allows you to link up to 3 social media accounts. Hootsuite’s free plan also allows up to 3 profiles for free. You could also use one paid service and one free service to allow more flexibility. I’m still playing around with this myself, so let me know if you have a strategy that’s worked really well for you. Pick one social media scheduling tool and sign up for a free account. Test scheduling social media for the next week. Decide when and how long you want to spend actively on social media for socialization. Block that time into your schedule, and stick to it! On any given day, hundreds of emails can flood your inbox. On top of work-related emails, there’s the school information, Amazon notifications, bank statements and the endless, endless lists of promo emails that you don’t even remember signing up for. It’s entirely too easy to miss out on the important information (I see you, library almost-due and overdue notices) with all the clutter. Unsubscribing from non-critical information is one way to go, but often there’s that occasional email that you do want and don’t want to miss out on. How do you easily remove the clutter to focus on what’s important – without ditching it entirely? 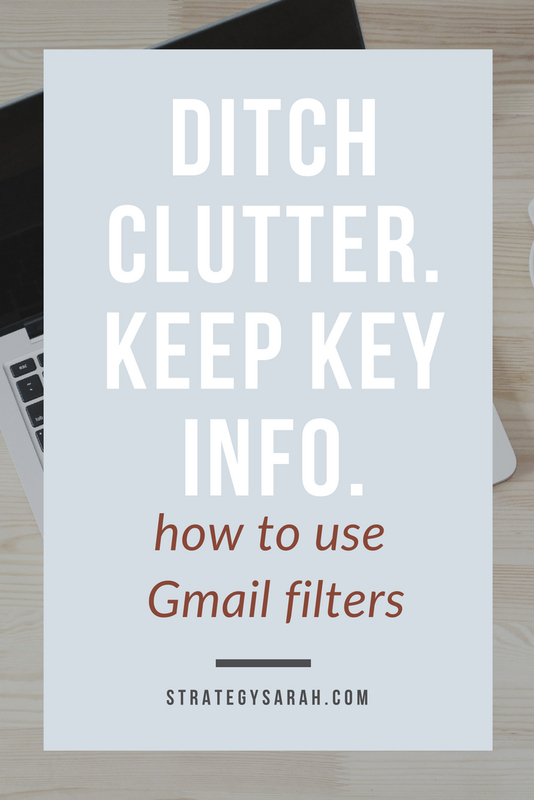 One super easy way is to set up filters in Gmail! I have filters set to automatically send almost all of my emails to the relevant folder – automatically “filing” them away for me. It’s genius. 4. Create Filter with this search. 5. Apply the label (you can add new labels here, or select from a pre-existing list). 6. 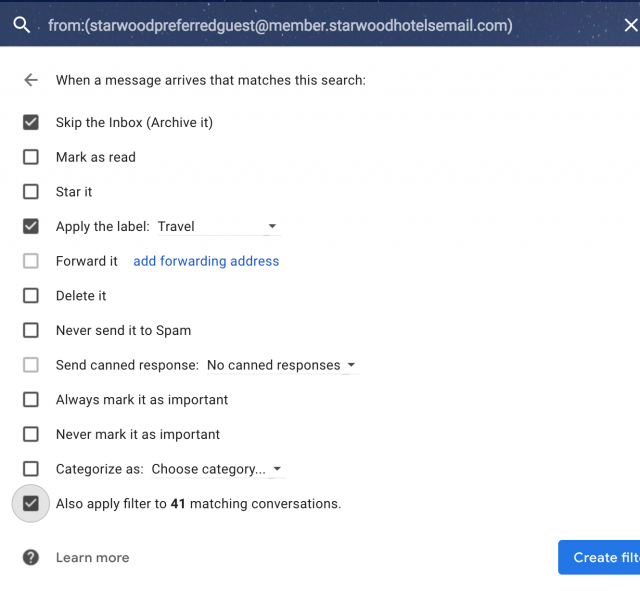 Decide whether or not it should Skip the Inbox (hint: If it has a label, it probably should skip the inbox). Setting up filters is a great one-time action that will save you time and energy every day moving forward. 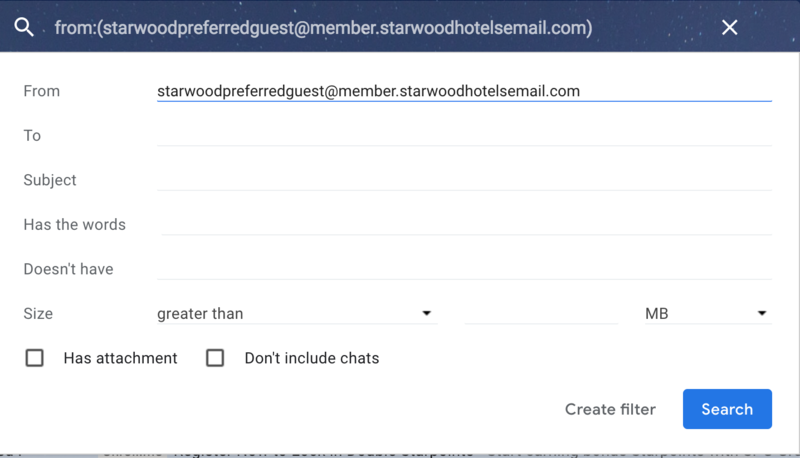 Take 5 minutes today and set up your email filters.